Director: Paul Schrader. Cast: Nick Nolte, James Coburn, Sissy Spacek, Jim True, Willem Dafoe, Brigid Tierney, Mary Beth Hurt, Holmes Osborne, Sean McCann, Wayne Robson, Marian Seldes. Screenplay: Paul Schrader (based on the novel by Russell Banks). The new film Affliction, which should rightfully be called Paul Schrader's film but feels much more like Nick Nolte's, can only wish it were as pungent and forcefully committed as the performance of its star. The film is about the process by which one man, despite (or perhaps through) the most strenuous efforts to the contrary, becomes exactly the kind of man he does not want to become. The spectacle that makes Affliction worth watching is that of Nolte turning one of his shaggy, laconic, but mean-streaked Everymen into the most raging bull this side of Jake LaMotta, another role famously scripted by Schrader. Nolte's performance, in its subtle nuancing and carefully governed momentum, is powerful and satisfyingly cinematic; unfortunately, the rest of the picture has not been brought successfully off the page and adapted to the new medium. Schrader works here, as The Sweet Hereafter's Atom Egoyan did last year, from a novel by Russell Banks, but where Egoyan's camera let emotions bleed out from the images as much as from the ravaged worlds of his actors, Schrader is still a writer at heart who does not sufficiently appreciate the unique needs and capabilities of the camera. The first sequence in the film follows town sheriff Wade Whitehouse (played by Nolte) as he drives his reluctant daughter Jill to a holiday party put on by his tiny, wintry community. Wade, having divorced his wife Lillian (Mary Beth Hurt), now sees Jill only on appointed joint-custody visits, and despite his honest affection for the girl, he is not much of a father. It is telling that the evening he means to spend with her is actually the framework by which we are introduced to his relationships with other members of the town. With or without Jill, his mind is with his neighbors and, to the extent that he is the law enforcer, his charges. Then again, Wade is not much of a sheriff, either, toking up on marijuana with some good ol' boys in a pick-up truck and not even thinking to return back for Jill until his ex-wife has already shown up to collect her. There can be little doubt from these introductory scenes that Wade is a failure in all of the roles he has assumedfather, husband, sheriffand the astounding achievement of the picture (again, it is primarily Nolte's achievement) is to characterize with such precision the character of a permanent loser, a blowhard with wholly groundless self-confidence who perpetually misdirects his resentments and inadequacies from one area of his life into another arena of his experience. On the day after the Halloween shindig, commences the real drama of Affliction, for it finally seems as though Wade may get his chance to prove his latent professional mettle. A man has been shot and killed while on a routine hunting expedition with one of Wade's drugs-and-driving buddies, Jack Hewitt, played with proper reserve but little force by The Hudsucker Proxy's Jim True. Wade isn't buying it that Jack's companion could have died through such circumstances as Jack describes, and he becomes obsessed with trying to deduce the morning's actual events, to decode the riddle of how the death came to pass. 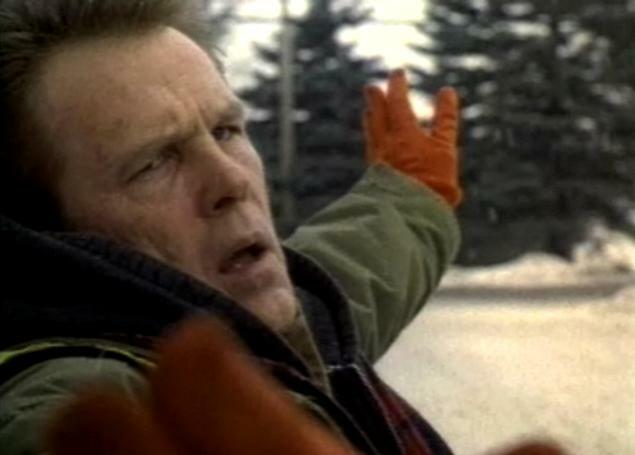 What is striking early on about Affliction is how well the movie keeps us riveted to this protagonist and this story despite the fact that neither Wade nor his personal odyssey invites any real sympathy. I am amazed that we can spend this much time with such a failure and not grow tired of his company; Wade is fascinating rather than merely frustrating. We see nothing particularly suspicious about the circumstances of the shooting, but perhaps because we are secretly rooting for Wade to come through with a personal victory, or perhaps because we are all so primed by movies and stories to believe the outsider when he insists something is being covered up, we are anxious to follow the methods by which Wade will delve into what he considers a murder case. Besides, even if True's characters is hardly an obvious villain, there is a certain unease about him and a casual smirk that appears a few times too often to make us comfortable. Even with all this going on, however, Wade has one much bigger fish to fry, which is his ongoing relationship with his father Glen, played by James Coburn to resemble one of those furious, captive grizzly bears that loggermen used to taunt as cruel recreation. Glen, as we see in flashback, has always been a rampager and a lout, and Wade was the child who bravely resisted and confronted Glen's leering advances and drunken tirades. His brother Rolfe, played as an adult by Willem Dafoe, more often took the road of avoiding Glen, and only in the last few days has Rolfe reappeared inside Lawford to visit his family. Relations between Wade and Rolfe seem fairly amiable despite the latter's long absence. Wade also has an improbably warm and, we sense, long-term rapport with Margie Fogg, a local bar waitress played by that suddenly re-emerging talent Sissy Spacek. The two are not quite lovers but more than friends, and Margie seems to believe as we do (or perhaps her belief is what gives the greater force to ours) that Wade is a troubled man who nonetheless has it in him to triumph over his anger and sadness and lead himself into a healthier, sturdier life in Lawford. If there's one problem with all of these scenariosa problem only aggravated by the richness and complexity of Nolte's performanceit's that all of the supporting characters are either distant and enigmatic enough that we cannot feel much for them (this is true, for example, of Jack Hewitt) or else they occupy such transparently symbolic roles in Wade's narrative (Margie the patient lover, Coburn the evil from the past, etc.) that Affliction winds up feeling in a strange way both too large and too small. The film straddles the line between psychological drama, in which case some of the characters seem too superficial, and allegorical comment on how the Sins of the Father are (or are not) transferred to later generations, in which case the entire murder mystery seems irrelevant, and the stunning specificity of Nolte's performanceclearly the ace in the film's handis needlessly coarsened into a universalizing Oedipal parable. Wade Whitehouse, though not unrecognizable, is hardly Every Man, and the film's serial rejection of its multiple subplots until it is left only with Wade and Glen's standoff, narrows the plot but broadens the meaning just when neither gesture is welcome. Meanwhile, Coburn turns Glen into such a teeth-clenching, outwardly hostile presence that I frankly got a little bored with him. I cannot attribute all of the blame for this to Coburn himself. The script treats him much less as an actual character than as a symbol with a long, dark gallery of meanings: he represents Wade's past, Wade's nightmares, and after a while, Evil itself. Coburn has little room to do much but embody odiousness for two hours. Still, there are ways of passing this stuff off subtlyever seen The Silence of the Lambs? Coburn goes the easier route of blatant repulsiveness. Maybe his acting joints have stiffened after years of playing two-dimensional heavies in films like Eraser and The Nutty Professor. Schrader carves his story into flat, broad dimensions as though it were a Greek tragedy, and the characters and their actions would achieve forceful meanings of their own. He spends less and less time trying to say anything with his camera, and so the most irritating aspect of Affliction is that we are always watching it with a literary eye for who represents what. We receive the picture not as a film but merely as a story, and not a terribly original one at that. Willem Dafoe, playing the character whom we care about the least (and doing so rather badly), is for some reason saddled with the most cumbersome, overdrawn, and unnecessary voice-over dialogue I have heard all year, including what seems like three or four minutes of pure talking at the end that egregiously refuses to show us, rather than merely describe to us, a resolution. The only way of recuperating this thudding conclusion is to understand Dafoe's remote appraisal of distant family events as comparable to the clearly specious psychiatric diagnosis in Psychowe are meant to hear the inadequacy, inconsistency, and self-importance of Rolfe's appraisalbut even from this angle, the strategy is undeserved. Why is the film inviting us to heed or even to critique Rolfe's point of view, when Rolfe is the last character, particularly after the penultimate scenes, in which the audience can possibly hold any investment?